Well what a week it was for coho, best described as feast or famine. 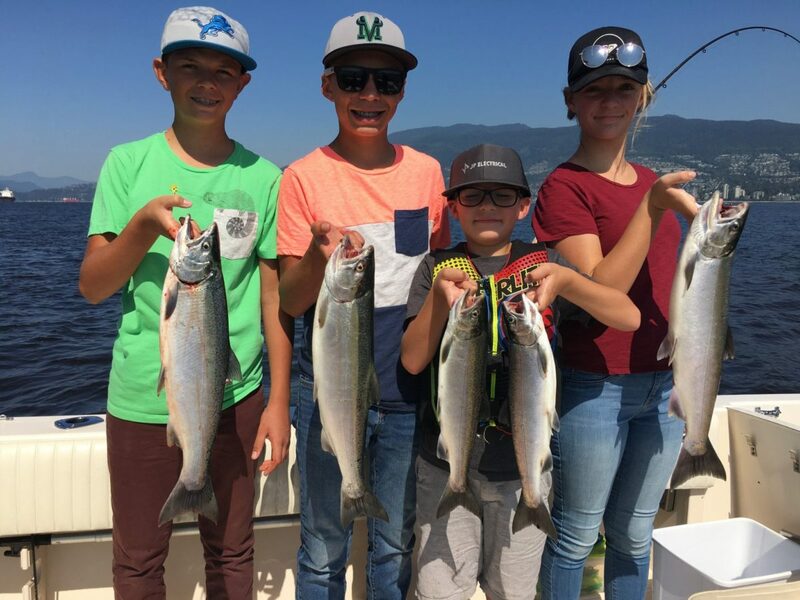 There were a few charters where we felt lucky to get a bite and then there were a few charters where our guides literally hit the mother lode! Below are a couple of pictures from 5-hour charters, yes 5-hour charters, not 10 hours of coho fishing. In fact these impressive limits were caught in a few hours for the most part, as midweek our guides got on a huge school of hatchery coho. One of the days Eddie limited out so fast he had enough time to zip over to the Bell and get a chinook before he had to leave at 11:30 am to be back at the dock for noon for his 1:00 pm charter. Remember that these coho are from the Capilano Hatchery and are specifically reared to provide a sports fishery and be harvested. The hatchery wants us to catch and keep these coho as there is little or no natural recruitment ability left for this river because of the dam, hence the hatchery production. So no bleeding hearts about limits of coho please, that is what they are here for and that is why our regulations allow us to harvest hatchery coho and why it is catch and release for all wild coho. In terms of flashers and lures, we were using the same gear we have been using all season long and that has been covered in previous reports. Okay on to chinook, and yes I will be talking about sockeye soon. So chinook fishing has been slow. There has been some taken off the Bell, T-10 and Sandheads, but for the most part it has been slow. This isn’t surprising as the forecast for Fraser River chinook is average at best this year so I am not expecting it to be red hot quite yet. You will see some good fishing for sure, but not likely until mid next week. The full moon is on Saturday and that means big tides, and usually a few days after the first full moon and big tides in August the chinook show up. In fact they might be showing up right now as a report just rolled in that a friend of ours got 4 yesterday afternoon at Sandheads. 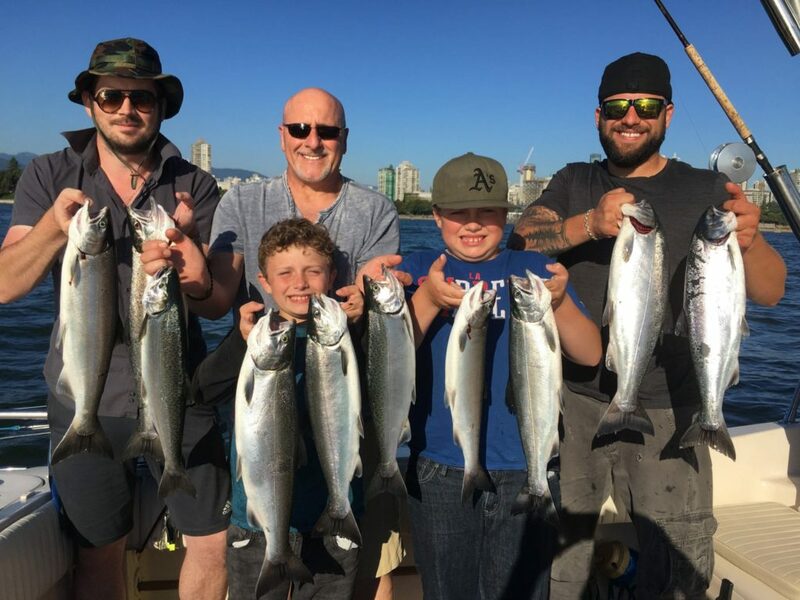 We had a lot of shorter trips these past 72 hours so we were local and were coho fishing, but today and this weekend we are on longer trips and will be down at T-10 or Sandheads. Some of our boats just texted us that they have been into a few good ones this morning down at Sandheads, so that is promising. For chinook you want to keep the gear shallow, 75-30 on the riggers and fish bait on all your rods. I will get more into flashers and teaser head choices next week, as I need to save some room for sockeye gear this week. The short and sweet version is UV and Chrome flashers and teaser heads on your top rods and Glow flashers and teaser heads on your bottom rods. Okay, finally time to talk about sockeye. The forecast is 13.8 million and it looks like we are going to get that or more based on the current data, hence the 4 fish limit and early opening of August 1. The numbers are steadily building and we expect a good push to show up mid next week, just like the chinook. The fish are there in catchable numbers right now but some people seem to be struggling while others are getting quadruple headers and limits. So you have to be on the right school on the right day but it is officially time to go. The boats that are doing well are running lots of dummy flashers. Don’t try running chinook gear on one side and a few sockeye hootchies on the other; this isn’t going to get you many fish this time of year. If you want the big numbers you have to commit and run lots of dummy flashers so the schools of sockeye will follow you and then bite your hootchies. We are stocked with hootchies! We recommend running at least 2 dummy flashers if not 3 and then stacking 2 rods above that. The best colour is not red. Blue is the go to this time of year as it mimics the bright blue back of these fresh sockeye.We just got a custom order from Gibbs. They are blue blade flashers with silver hex prism tape on one side and glow tape on the other side. These are killer for sockeye so get them while supplies last. Here is a diagram to get your started on your sockeye gear. If you fish like this you are going to do well. We have set lots of customers up this way this past week and they have had limits while boats around them are scratching their heads.